169 jam-packed pages of the latest 2010 jewelry selling secrets. Everything you ever wanted to know profiting from handcrafted beaded jewelry - including how to source at the lowest prices. Cash for good Jewelry is out there with Your Name on it! Everyone wants extra income. You’ll feel great when your custom jewelry brings in thousands of extra dollars. It’s easier than you think, and this straightforward book shows you how. For years you’ve been threading beads, designing jewelry. Your hobby has made you an expert in the craft. Your home is a jungle of beads, your drawers are overflowing necklaces - and you’ve run out of friends and relatives to give away to. Now is the time to make money from your handcrafted jewelry. Don’t hesitate taking your hobby to the next level. You need the extra lucrative income to fight the recession, and it’s a lot of fun. It’s easy to sell handcrafted jewelry, since there’s always a market for originality. Large jewelry companies can’t compete with you because of the high-cost of design. One-offs don't come cheap. There’s a huge demand for original well made jewelry. The problem facing most crafters is finding paying customers among increasing competition. To succeed you must carefully plan everything. Minimize costs, maximize selling price, and market like hell. If you follow some of the ideas in this book, you WILL make money. This complete beading success manual is saturated with hundreds of little-known proven jewelry selling techniques. All the information you'll ever need to help you make money from your bead jewelry passion. "Implementing the suggestions in Nigel McKay's new book will help whether you are just starting out or want to expand your business. He has alot of knowledge of beads to share and his enthusiasm for selling fairly leaps off the pages. Read this book and you'll see your profits increase." Nigel Mckay, known as MrBead, has built his bead business over10-years. Last year sales averaged over US$1,000 a DAY! Now he's penned his marketing secrets in this easy to follow guide so you too can successfully make a killing selling your handcrafted jewelry. There’s more to making jewelry as an income than just buying beads, copying a design, and hoping someone will buy. It’s very frustrating for the beginner to find most of their expensive stock is wasted and the jewelry they painstakingly made won’t sell. A complete waste of time and money! Then there’s the hardest part: getting started! What’s been holding you back up to now is your negativism. This book will motivate you to start immediately, and follow through to make lots of cash. Even if you already make and sell designs, I’m sure you crave the fruit real success brings. Healers and new agers believe certain gemstones heal on a metaphysical level, because of the earth's energy that has been absorbed by these stones. This book explains what the stones are, along with a color photograph of each, and the benefits of 48 of the most popular gemstones used to make jewelry today. Not only is this bonus book fascinating reading - but it's a wealth of knowledge opening new channels of information which you can use to help sell your jewelry. Don't miss out on the golden opportunity to acquire your own copy of this valuable book, usually sold for $12. And you can keep this e-book even if you get a refund of How to Make a Killing Selling Bead Jewelry! I've received many e-mails from frustrated customers about making and selling beaded jewelry. Yet when I looked for a book on the subject, I couldn’t find any. There are lots on making jewelry and a few on selling, but all are very limited and lacking detail. I know, because I’ve read most of them! Basically there is a lack of information out there, and what does exist is unclear, longwinded, dated, and plain boring. This gap in the market encouraged me to write my own guide to help the hundred-of-thousands struggling to make a few bucks from their hobby. I built a website with a questionnaire asking what they wanted to know. It seems there is hunger to start, but people are reluctant to take the first steps. And many that do try designing jewelry find it difficult to sell. These people tell me “I can’t rent a space in a jewelry fair because it’s too expensive”. What they really mean is they can’t sell enough to cover the costs! How to sell more by charging more! This guide is very comprehensive: 71 sections in 169-pages cram packed with invaluable information. Some e-books costing a lot more only give half as much! Not only that, but it’s written from a beader who’s been running a successful bead business for over ten years! Click here to see the many categories – I think you’ll agree it covers just about EVERYTHING you need to know to buy, make, and successfully sell beaded jewelry for very good profit. "I stand behind my claims"
"I’m so confident you’ll agree with everything I say, that if you’re not 100% satisfied after 60-days, I’ll refund you in full! You have nothing to lose. See for yourself that the ideas enclosed do actually work. But don’t waste time, follow the instructions right away – I want you to make money quickly!" Don’t hesitate - order your copy NOW! Just one idea out of the hundreds suggested could make you a lot of money. Even the first chapter’s worth a fortune to you if it succeeds in motivating you to sell more. If you’d like a sneak preview, you can download two sections by clicking here. There’s no obligation to buy the rest of the book. Read the guide. Examine the strategies. Test the ideas. Use the system. However, if How to Make a Killing Selling Bead Jewelry helps you achieve your dream of making money from beading, then I'd appreciate an email of your success story telling me about the results you achieved - and tell your friends about it too! There's zero risk to you - not one penny. You have nothing to lose and everything to gain. Good luck. To have someone credibly research all this in-depth information and present it in a way so easily understandable would cost you thousands of dollars. Particularly in such a specialist business. It's taken me literally hundreds of hours to write. 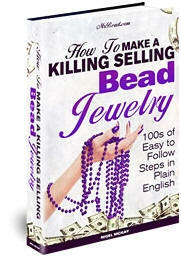 Which is why How to Make a Killing Selling Bead Jewelry is such a bargain at $29.99. That's right, a fraction of what it's really worth or what it cost me to research. Why have I make it so affordable? I’m practically giving the guide away at this price! Because I’m a beader myself and this is my first e-book, I want it to be a success (I’d like to write more). Plus, my costs to deliver it to you are so low. However, once I get a few more testimonials from satisfied customers, the price will increase - so don’t wait too long before purchasing! When you consider the work involved and its direct cash value to YOU, it really is a bargain! Just a couple of strands of good beads. Beading and making jewelry books will never be top sellers, so it'll be hard for me to cover my costs. I could have easily make a lot more money splitting the guide into two or three separate books or selling everything as monthly classes (especially as the guide's so extensive). Just one of the hundreds of selling and marketing secrets enclosed will bring you many-times more than the cover price. Both in extra profit you'll make selling and in savings purchasing beading supplies. Take advantage of the no-risk guarantee and free bonus book on Gemstone Properties and order RIGHT AWAY! Your payment is totally refundable. You can be on your way in five minutes! No waiting for the mailman, the guide will be delivered to your computer in minutes. Simply click the above link and enter the information on the totally secure server (see the https in the URL – “s” is for secure). The guide comes in PDF format which is the most popular for e-books because it can be read using ANY computer or operating system. Over 99% of computers have a PDF reader installed, but if you need one the Abode Reader is free here. You can then printout or easily search different topics, words, or pages to read from your screen. This is important as the guide is designed for fast reference to valuable information, rather than the type of book you read from cover-to-cover. How about a second bonus! This little book will get you selling on eBay and quickly help you to build up to Power Seller status. Ideal for the beginner. 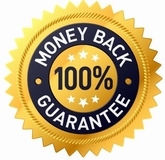 · Welcome to eBay and Tons of Income Opportunities! · What's Your eBay Reputation Really Worth? This book sells for $5.99, but if you take advantage of our offer for the brand new, published summer 2010, book How to Make a Killing Selling Bead Jewelry, it's yours for free. The bonus books alone are worth $17.99! "This All Sounds Fantastic but can I Really Do It?" Good question! The truth is: these strategies can be easily understood and implemented by anyone. You don’t have to be an expert jewelry designer or have a lot of business experience to get fantastic results with these methods. You're free to make as much riches as you want. Whether you sell jewelry just weekends or you want to escape the hassle of a 9-to-5 job and make it your full-time income. No matter what, this guide’s a bargain for you. Order NOW, and be reaping the benefits in a very short time. Before I plan on raising the price to $48 once I get a few more testimonials from satisfied customers! Remember, it's packed with priceless up-to-date 2010 Information. $29.99 is a modest investment compared to what you learn from these secrets. You’ll make it back on your first sale! And don't worry, if for any reason you're not happy with the guide, I’ll refund you in full. You have nothing to lose. Order Now - you have nothing to lose! PS: Don't forget - this PRICELESS information comes to you with a full 60-day guarantee. You have nothing to lose! PPS: If you have a friend or relative who might benefit from this guide, do them a favor by sending them a link to this site. Copy & paste the URL in your browser into an e-mail. Like this book? Then why not make money selling it yourself! To join our generous affiliate program, click here. This site and the products and services offered on this site are not associated, affiliated, endorsed, or sponsored with eBay or Google, nor have they been reviewed tested or certified by eBay or Google. © 2010 Easy to Follow Books. All Rights Reserved Worldwide.